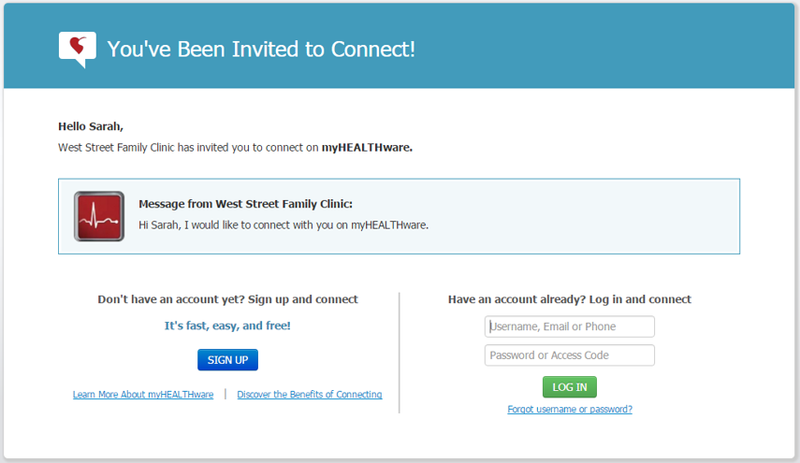 Q: How do I enroll a patient in myHEALTHware with their email address? 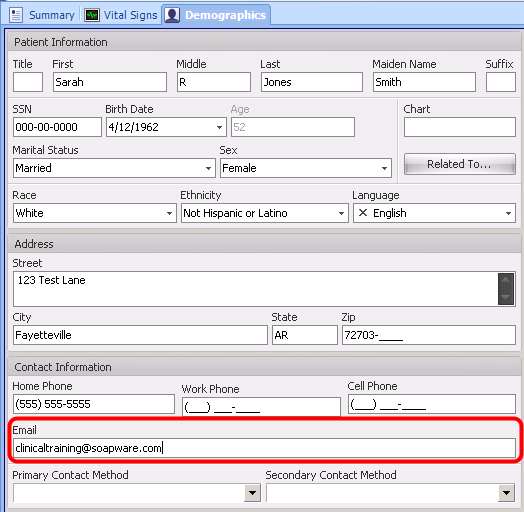 To invite a patient to enroll in myHEALTHware using email, open the chart and enter the patient's email address into the Email field within Demographics. Click on the myHEALTHware icon located on the left side of the chart tab (as seen in the screenshot above). Select the Invite by Email option by clicking the Envelope icon. Enter the patients email address (if the email address was filled out in the patients demographics section, this box will be defaulted to contain that same email address). Select the patients Role by choosing either Basic Subscription or Premium Subscription. For more information on these two options, please see: Change the Patient's Subscription Level (Basic vs. Premium). 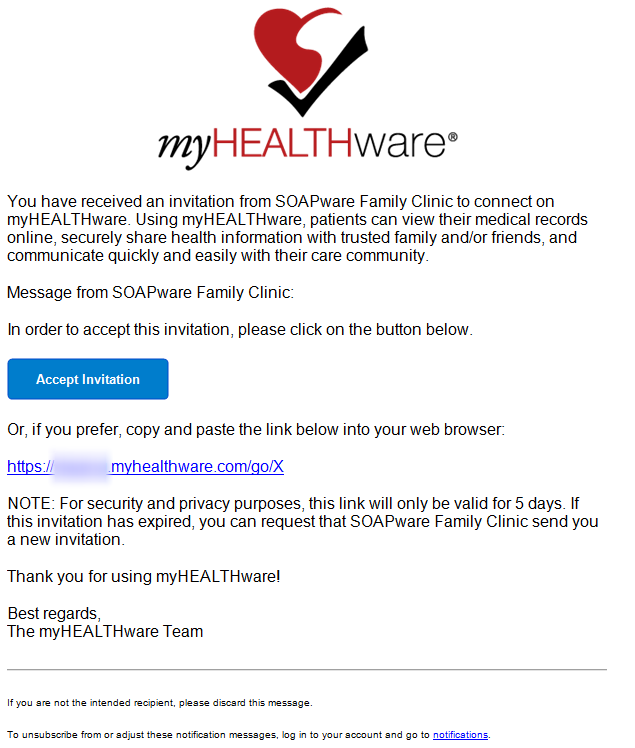 The patient will receive an email from myHEALTHware (noreply@myhealthware.com). Included in the email will be a link where they can accept the invitation and complete the registration process. 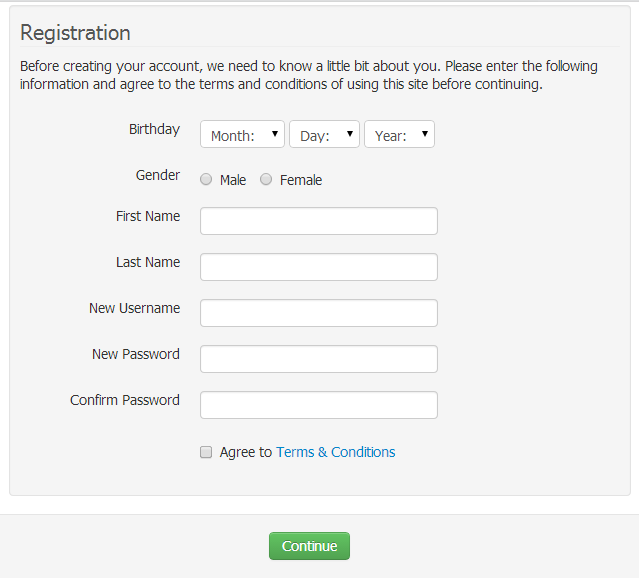 The patient should click on the Accept Invitation button, or the link that is provided,(or copy and paste the link into their browser), to complete the registration process. *Note: For security and privacy purposes, this link will only be valid for 5 days after which it will expire. 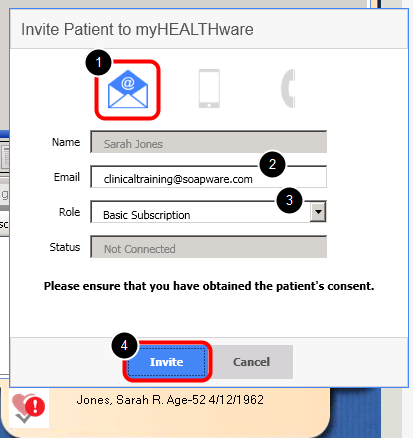 If the patient does not complete the enrollment process before the invitation expires, you can resend the invitation from their SOAPware chart. Log In to myHEALTHware using an existing account. You can now send communication to this patient via myHEALTHware Conversations. In addition, you can upload a Summary for your patient to review as documents are signed off.